I was upset after last night’s episode-it left me chilled! Here is something I found I thought was interesting and funny. 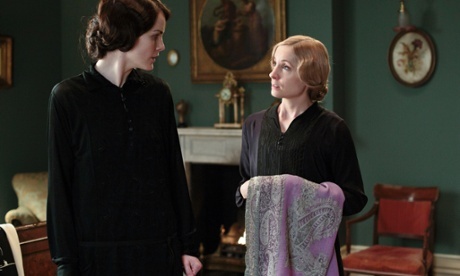 Spoiler alert: This blog is for people watching Downton Abbey season four. Don’t read on if you haven’t seen episode two. Our enjoyment of Downton Abbey aspires to lightheartedness, but there was nothing lighthearted about the way the new episode ended. What befalls Anna is more brutal, as presented, than anything the series has yet seen, and that includes literal trench warfare. Did they have to? Isn’t there something cheap about taking a two-dimensional character of methodical virtue – Anna is so saintly she can be boring – and then, in one violent scene, leveling her? And intercutting the attack with an opera performance, in another lazy recycling of The Godfather? Bother. Maybe this was supposed to provide the jolt that season four was widely thought to be looking for, the hard twist that would return the Abbey to its edgy early days, back when Lady Mary and Mr Barrow were fornicating (in parallel, not ensemble) and Lady Edith was such a ghastly little snitch. After 27 episodes, it’s understandable that creator Julian Fellowes and company are seeking new vigor. But this? It begins with a fleet of cars arriving for a house party meant to capture the estate’s old glory. In attendance are a duchess, a couple lords, Lady Edith’s publisher boyfriend and a chap from the club nobody really knows but who seems nice enough. He’s not, but the real snake of the bunch is one Mr Green, valet to Anthony Foyle. Bates, in his hard-won wisdom, distrusts Green from the start. Braithwaite makes her move on Tom, who’s feeling vulnerable; Sir John Bullock charms Lady Rose, who seems receptive; Lady Mary and Cousin Isobel begin to get past their grief; Michael Gregson finally gets on Lord Grantham’s good side; and Mrs Patmore has a near-heart-attack, which allows Alfred a chance to prove himself in the kitchen. It’s a perfectly fine Downton outing, until the end, when we get made-for-TV Francis Ford Coppola. Did it have to go down like this? 5) Lord Grantham decides to take up golf, a sport that has caught fire in England after a long gestation in the north. “I can’t escape the sense,” he tells Bates, who is, with not inconsiderable difficulty, acting as caddy, “that I could be so much better, if only I had the time to play.” The dowager countess, of course, is scandalized. “In my day,” she says, “if someone handed you a stick and a ball, you put them away in a closet and kept them there.” Then she arches an eyebrow, purses her lips and looks at something off yonder, and wins an Emmy (offscreen). 6) Lady Mary finally hits on a scheme for saving the estate, inspired by the release of the Rolleston Committee report endorsing prescription heroin for Britain. Mary’s ingenious plan: grow drugs. She converts her share of the tenant plots to poppies. Lord Grantham thinks it’s a bad idea – “Downton is not some sordid stop on the Silk Road” – but Branson is all for it. He gets a Tommy gun and an armored Packard. 7) Isis the dog has a litter of puppies. Puppies. Everybody likes puppies. This entry was posted in Downton Abbey, family life, interesting ideas and tagged History, Home, travel. Bookmark the permalink. So you watched last night?? So did I, could you BELIEVE it??? The whole thing was so disturbing. So far season 4 has been disappointing. I feel Season 4 has been disappointing, also. I love your suggestions for improvement…putting the violence against Anna into last night’s episode doesn’t address the Downton audience..also, there are too many petty incidences with the lying Thomas…Maggie Smith continues to entertain us…the disappointments are Lord and Lady Grantham….Thomas…..the raper……all characters without character so far….lightweights…..it shows an inability to create a story with depth to the players ….I’m disappointed in Fellowes. This was great, my thoughts exactly. I think the series is on a down hill slide. Too bad. My British daughter- in- law doesn’t watch it and she was married in Highclere Castle.